Come hear Jory Vinikour and Pro Musica Colorado Chamber Orchestra on February 22, 7:30 pm. Check out a concert first! The 21st Century is evolving the classical world with music that takes inspiration from previous eras and multiple cultures. 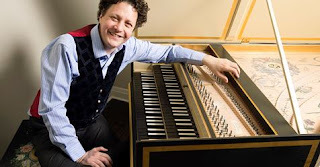 Harpsichordist Jory Vinikour performs with PMC a World Premiere of Max Wolpert's Harpsichord Concerto #1, “Baroque in Mirror," a work that pays homage to Scottish, Jewish, and Welsh fiddle players from the Baroque era. Bach's Harpsichord Concerto in D minor, often claimed as one of his best concertos, demonstrates the staying power of Bach's music in our century. Haydn's Symphony No. 22, the Philosopher, completes the program and explores the landmark of modern symphonic music.